We are a private, family run business, offering tours along the Causeway Coast and Antrim Glens. We are a private, family run business, offering tours along the Causeway Coast and Antrim Glens. All our tours are tailored to suit your needs, and provide good value for money. Our Tour Guides are local, having lived in the Glens of Antrim all their lives. They can guide you to places of interest, off the beaten track. We specialise in catering for smaller groups, so we can offer a more personal experience. Our tour begins at a time to suit you from your chosen departure point. We will drive along the famous Antrim Coast Road, visiting places of beauty and interest. Along the way, we will go off the beaten track and travel along narrow winding roads, guiding you to places only locals know about. We will take in Torr Head, with its great views of the Mull of Kintyre, Scotland, the Scottish Islands of Islay and Jura and the rugged, beautiful island of Rathlin, which lies six miles from Ballycastle on the Antrim Coast. We will visit Murlough Bay, Ballycastle, Carrick-a-rede Rope Bridge, Ballintoy Harbour and the Giant's Causeway World Heritage Site. On our return journey we will visit the Dark Hedges and the village of Armoy, the birthplace of Joey Dunlop. 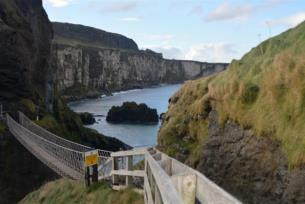 Along the way we will be discovering what this part of the Causeway Coast and Glens has to offer. The Antrim Glens and Causeway Coast poses such a vast number of ancient sites that most of them remain unknown and all but forgotten except by those who live nearby. There are simple wells and stones which are still regarded as places of pilgrimage to the local people. There are also sites of national importance, holy mountains, valleys and rivers created by giants and protected by fairies; ancient churches, round towers, mass rocks, built on sites held sacred for thousands of years. Rathlin is small in size, but exceptionally rich in heritage, its spectacular setting off the North Antrim Coast, and its stunning rugged landscape have had an unmistakable influence on how successive generations have lived and worked on the island over the millenia. Today, Rathlin has earned a reputation as an island of peace and tranquility where the scenery is bold, wild and fascinating. Discover about the history, wildlife, inhabitants and culture.